JICC took over the screening of applicants from the Department of Foreign Affairs in 1967. Part of my work at the Japan Information and Cultural Center is the Monbusho or Monbukagakusho Scholarship Program thus, from 1967 until my retirement in 2005, I was privy to the screening, studies in Japan and post-Monbukagakusho years of our scholars. Initially I was only an interested bystander in PHILAJAMES activities since I am not a former Monbusho scholar. I went to Japan on an Asia Foundation grant so I am a founder and former President of APPAJU or Shihi Ryugakusei Kai (the association for alumni of Japanese universities who were not Monbusho scholars). In 1982, during the Induction Ceremony of Dr. Efren Flores as PHILAJAMES President, I was awarded a “Membership Award” for my services to the Association. In 1984, during the return term of Mr. Jovencio Torres (the original Founder), I was elected “Permanent Secretary of PHILAJAMES” during its general assembly meeting at the Friendship Hall of PHILFEJA. For this special appointment, a Special Resolution was prepared by Mr. Ysidro K. Castillo, Jr., one of our association’s most active Founders and the succeeding President of the Association (1987-88). Thus from 1984 until my retirement in 2005, I was PHILAJAMES Secretary and got the chance to join and help in planning all the activities of our association. When Philajames gave me a special Recognition Party during my retirement, I relinquished the post to Dr. Amelia Fajardo and volunteered to be an Adviser instead. I continue to assist PHILAJAMES whenever I can. When it comes to fond memories of PHILAJAMES, I have plenty. I will always treasure the friendship and camaraderie of the active members in some unforgettable experiences. Of these one that stands out is our “lanzones-picking outing” in San Pablo City where Mr. Ysidro Castillo, Jr. resides. He was the President of San Pablo City Development Bank. The various medical missions participated in by PHILAJAMES doctors and dentists (including dental students of the University of the East) were also unforgettable. One mission was in Binuangan, an island barangay of Obando, Bulacan. 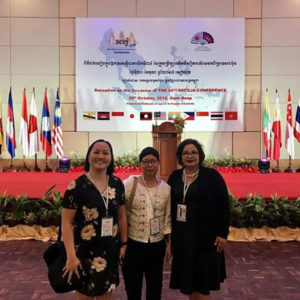 When we were leaving in the afternoon, high tide arrived flooding the whole island so Dr. Jess Garcia, who has artificial metal legs, had to be carried to the boat. The summer frolic at Subic Naval Base in 1985 and 1986, courtesy of Usin and Nina Pisingan who were both teachers at the Base were fun. At that time, not everybody can enter and use the base facilities so it was really a privilege for two full buses of PHILAJAMES members and their families to enjoy the hospitality of the military granting us access to the beach and allowing us the use of their boats. The first Orientation for departing Monbusho scholars held in April 1987 during Dr. Alma Bautista’s term was significant. The many times Mrs. Juliet Villazor (one of the early sempais who studied Japanese art and culture) demonstrated fruit arrangement and Ikebana, not only to members but also to students, teachers and enthusiasts, were enjoyable. During the terms of Mr. Castillo (1987-88) and Mr. Edgardo Valencia (1988-1990), our PHILAJAMES Christmas parties were held at the Philippine School for the Blind in Pasay City so we can share our blessings with the students. We had bowling tournaments, and held The Big Japan Education Fair at Century Park Sheraton in 1994 with 40 Japanese universities participating. We also held various educational symposiums and lecture-forums in different parts of the country, and each of them were memorable in their own way. I look forward to more memorable times with members of PHILAJAMES, an association I have grown accustomed to and fond of through the years. 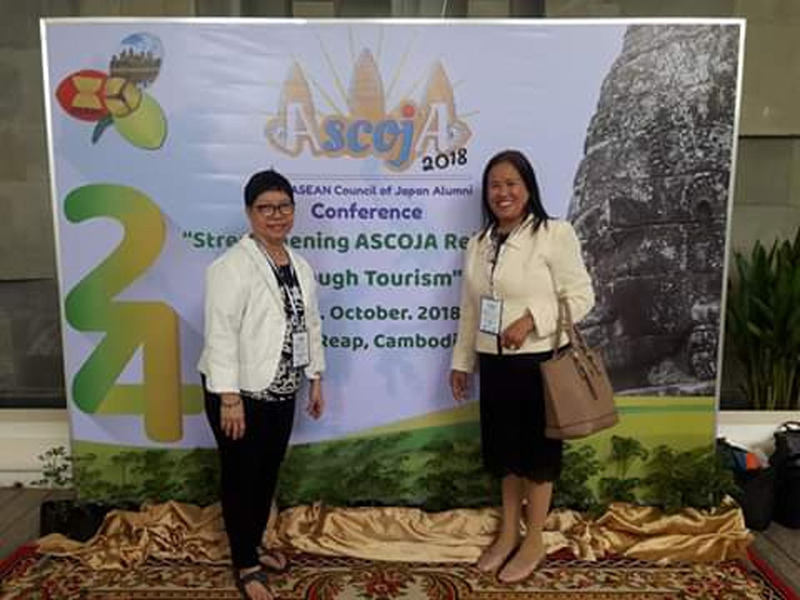 Ms. Cecile Tolentino, current PHILFEJA Secretary, attending the 2018 ASEAN Council of Japan Alumni (ASCOJA) Conference in Cambodia, with Ms. Aida Cabrera of the Dept. of Education. 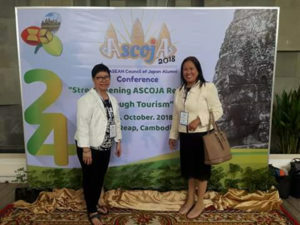 Sempai Cecile, with daughter Joanne to her right, and Ms. Gennie Ferma, Administrator of Phil. Japan Friendship Foundation (PJFF). I will always be grateful to you Ma’am Cecille for assisting me when I applied for that scholarship. Being a probinsyana, I really appreciated your effort.